Over the years, the makers of modern India have been parochialised by the sect or state to which they originally belonged. Rabindranath Tagore, whose stories and especially essays are of universal appeal, is now considered an icon of Bengalis alone. Vallabhbhai Patel, without whose efforts India would not be a united nation, is now hardly remembered outside Gujarat. Jawaharlal Nehru, who helped nurture a democratic ethos across India, is now the property of a single party. A fourth Indian who has become a victim of sectarian diminution is B.R. Ambedkar. He is now known only for his contributions to the emancipation of the subaltern castes. To be sure, he did a great deal to instil a sense of dignity among the oppressed. But we seem to have forgotten that he was not just a militant Dalit, but also a wise democrat, whose life and thought can profitably be studied by all Indians, regardless of the caste or religion to which they belong. This week, we celebrate the 60th anniversary of the Indian republic. Our republic owes its existence to a constitution whose drafting was overseen by Ambedkar. In his last speech to the Constituent Assembly—delivered on November 25, 1949—Ambedkar issued three warnings that are compellingly relevant to the predicament that the nation finds itself in today. First, he urged his compatriots to “abandon the bloody methods of revolution”. In the circumstances of colonial rule, there were grounds for taking to the streets to protest, and even perhaps to use violence. But with the coming of a free, sovereign and democratic republic, wrote Ambedkar, “there can be no justification for these unconstitutional methods. These methods are nothing but the Grammar of Anarchy and the sooner they are abandoned, the better for us”. Ambedkar would have been appalled by the activities of his fellow Maharashtrian, Raj Thackeray. But he would have had no time either for the Maoists, who claim to speak on behalf of the disadvantaged. He would have urged them to persuade rather than coerce citizens to their point of view, to abandon the gun and enter the democratic process that the Constitution had legitimised. 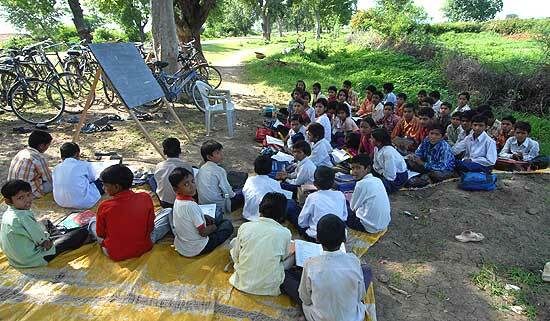 The Indian republic’s promise of equality that Jaipal Munda banked on has been belied in the last 60 years. When he spoke these words, Ambedkar may have had the possible deification of the recently martyred Mahatma Gandhi in mind. But they seem uncannily prescient about the actual deification of a later and lesser Gandhi. In the early 1970s, Congressmen began speaking of how “India is Indira and Indira is India”, a process that culminated, as Ambedkar had foreseen, in the eventual dictatorship of the Emergency. 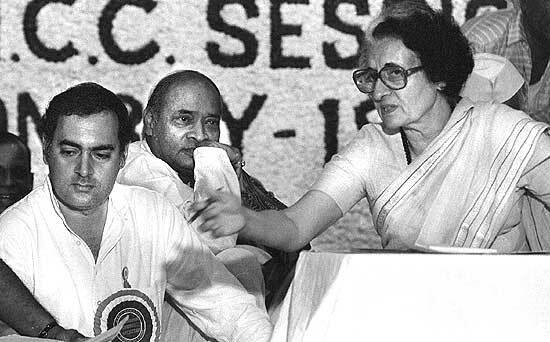 Now, a generation later, the party chooses to be more ecumenical, distributing its veneration equally among four Gandhis, two of whom are deceased (Indira and Rajiv), two others living (Sonia and Rahul). Last year, on a visit to Arunachal Pradesh, I was taken from the Rajiv Gandhi University—where I was staying—to see the Indira Gandhi State Museum. The next day, I drove from Itanagar to Guwahati. Just before crossing the Brahmaputra, I passed a gleaming yellow structure built by the Assam government—this, a board informed me, was the Rajiv Gandhi Indoor Stadium. Such naming of parks, offices, airports, sarkari schemes and so on after Indira and Rajiv is ubiquitous across India. Their contributions are remembered and honoured; their errors forgotten or suppressed. They are even given credit for policies that were actually the work of other Congress prime ministers. Thus party and state propaganda insist that Indira rather than Lal Bahadur Shastri initiated the Green Revolution, and that Rajiv rather than P.V. Narasimha Rao liberalised the economy. The cult of the Nehru-Gandhis, dead and alive, is deeply inimical to the practice of democracy. It has led to the corruption and corrosion of India’s premier political party, whose own example in this regard has been eagerly followed by the regional formations. Travelling through Tamil Nadu last month, I was met at every turn by ever-larger cutouts of the heir apparent, M.K. Stalin—of Stalin smiling, Stalin writing, Stalin speaking into a cellphone. The only other place where I have felt so stifled by a single face was in the Syria of Bashar Assad; but then the last time I went to Punjab, the Badals were in opposition, and I have not visited Lucknow since Mayawati became chief minister. Parties professing violent revolution are antithetical to democracy; so, too, warned Ambedkar, are parties based on the principle of bhakti or hero-worship. The proliferation and increasing influence of the political family firm has led, as he had feared, to the subversion of our public institutions. In New Delhi, the Congress chooses ministers, governors and secretaries to government on the basis of loyalty or sycophancy rather than competence. The same practice is followed by regional parties with regard to the public offices that lie within their gift. Sometimes, it is the power to bribe rather than the ability to flatter that proves decisive in obtaining the job one desires. India has been called a “dynastic democracy”. Perhaps it would be more accurate to call it a darbari democracy. The atmosphere in national and state capitals resembles nothing so much as a medieval court. Intrigue and gossip are rife. Those who seek public office nudge themselves ever closer to the inner circle of the King, the Queen, or the Prince-in-Waiting. Those who already hold public office have one eye on their job and another on what needs to be done, sycophantically, to retain it. This is as true of Mayawati’s Lucknow and Karunanidhi’s Chennai as it is of Sonia’s New Delhi. Things are only superficially different in states dominated by ideologies rather than personalities. Where the Bharatiya Janata Party is in power, political preferment is crucially dependent on one’s equations with the Rashtriya Swayamsevak Sangh. In communist-ruled West Bengal, even secretaries to government and vice-chancellors are known to make regular visits to the CPI(M)’s headquarters in Alimuddin Street. Here, as elsewhere in India, a vast majority of jobs in the state sector, whether of low, high or middle rank, are filled by men (and less often, women) who are not best qualified for them. The one part of the public sector that remains somewhat insulated from corruption and sycophancy is the sphere of science. The Indian Institute of Science still produces research of quality, and the Indian Space Research Organisation still executes the tasks assigned to it with a degree of competence and professionalism. Otherwise, our public institutions are in a state of atrophy and decay. This hurts the poor far more than the rich, for they are dependent on the sarkari iskool and the sarkari aspatal—no Doon School or Apollo Hospital for them. Denied equality of opportunity, they are also denied the benefits of redistributive policies, with a large chunk of the welfare budget intended for their succour instead going into the hands of politicians and contractors. This brings us to Ambedkar’s final warning, which was that “political democracy cannot last unless there lies at the base of it social democracy”. As he pointed out, “on the social plane, we have in India a society based on the principle of graded inequality, which means elevation for some and degradation for others. On the economic plane, we have a society in which there are some who have immense wealth as against many who live in abject poverty”. 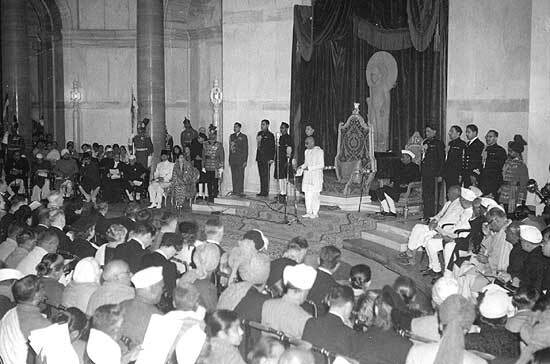 On January 26, 1950, by adopting a democratic constitution, India upheld the principle of “one man one vote and one vote one value”. However, our society continued to be deeply inequitous, “deny(ing) the principle of one man one value”. The statistics propping up our economic and political achievements hide shocking inequalities we haven’t yet set right. These hopes were to be falsified. For it is Jaipal’s adivasis who have gained least and lost most from six decades of electoral democracy. In terms of access to education, healthcare and dignified employment, they are even worse off than the Dalits. Meanwhile, millions of adivasis have been thrown out of their homes and forests to make way for dams, factories and mining projects intended for the producers and consumers of urban India. Thus the “exploitation and dispossession” have continued, to be answered by a fresh round of “rebellions and disorder”. It is surely no accident that the greatest gains made by the Maoists in the past decade have been in the tribal districts of central and eastern India. Apologists for the Maoists sometimes try to appropriate Ambedkar to their side, on the grounds that Dalits and adivasis have no option but armed struggle to resist and overcome their oppressors. But, as the remarks quoted earlier in this essay make clear, Ambedkar abhorred violence, rejecting it as a means of settling political disputes. In fact, he even had little time for non-violent protest on Gandhian lines. He was a constitutional democrat, who believed that arguments between citizens had to be resolved through the means of the press, the law courts and the legislature. It was as a patriot and democrat that Ambedkar uttered those warnings in his speech of November 1949. Recalling them 60 years later, one may be inclined to despair. I think that Ambedkar himself would have demanded that we renew and redeem the idea of India rather than abandon it altogether. Vigilance rather than cynicism may be the correct response to the crisis our state and society are currently faced with. Let us begin by acknowledging that what we now confront is indeed a crisis. Through the first half of the Noughties, there was much careless talk about our imminent rise to superpower status. After the recession, such talk receded, only to revive after the emphatic victory of the United Progressive Alliance in the elections of 2009. We now have a dynamic private sector, an energetic civil society. It’s the state that has been found to be wanting. Those who claim that India is a “rising global power” offer two statistics in their support—first, that, unlike China or Pakistan, we have held 15 general elections in a row; second, that, unlike the nations of Africa and Latin America, our growth rates are in the region of 8 per cent and 9 per cent. Aldous Huxley remarked of the Taj Mahal that marble conceals a multitude of sins. In the same manner, the statistics purporting to capture the political and economic achievements of India conceal, among other things, shocking inequalities in wealth and living standards; a third-rate education system and a fifth-rate healthcare system; a criminal justice system on the verge of collapse; a serious and still growing left-wing insurgency in central India; continuing tensions in the states of the northeast and northwest; a spate of farmer suicides in the countryside; rising crime rates in the cities; rapid and possibly irreversible environmental degradation in both city and countryside; a fragile neighbourhood (with Pakistan mired in sectarian conflict and Sri Lanka and Nepal scarred by civil war); and more. Arguably, the last time India faced a crisis of such proportions was at its birth. When Mahatma Gandhi died, in January 1948, the nation was confronted with religious rioting, food scarcities, a communist insurrection, angry and homeless refugees, and recalcitrant princes holding out for independent states of their own. If these (and other) problems were tamed and transcended, it was largely because of the visionary yet very focused leadership provided by the men and women whom Gandhi had trained. 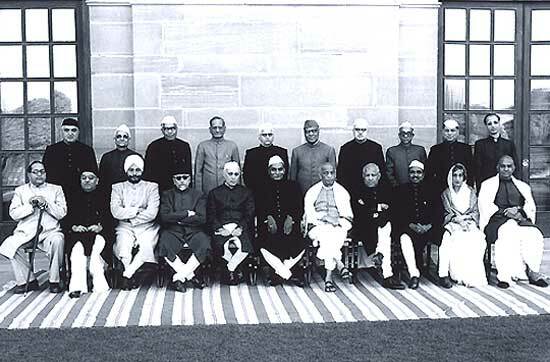 These included Vallabhbhai Patel, Jawaharlal Nehru and Maulana Azad at the centre; C. Rajagopalachari and B.G. Kher in the states; and Mridula Sarabhai and Kamaladevi Chattopadhyay in the domain of civil society. These names are but a sampling of the thousands of Indians who, inspired by Gandhi, helped pick up the pieces of a divided and desperate nation and put it back on the road to survival. 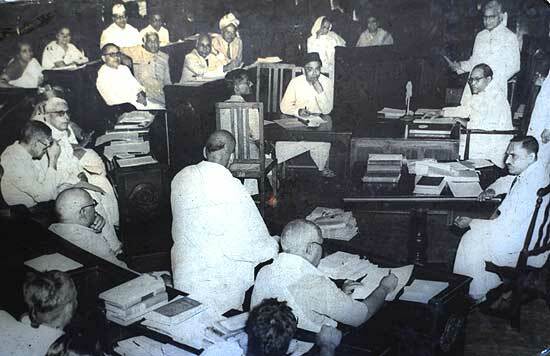 The document that finally marked the end of the nation’s teething troubles, and sign-posted its future, was of course the Constitution, which came into effect on January 26, 1950. Remarkably, the man who piloted this Constitution through the Constituent Assembly was himself a lifelong opponent of the Congress. How and why Ambedkar was chosen as the first law minister of the government of independent India remains a mystery. It has been speculated that Gandhi instructed Nehru and Patel to include Ambedkar in the cabinet, on the grounds that freedom had come to all of India, not merely to Congressmen. This seems in keeping with Gandhi’s extraordinary combination of personal generosity and political sagacity, whereby he was willing to overlook Ambedkar’s savage denunciations of himself in view of the younger man’s acknowledged abilities as a scholar and administrator. India was united, and made democratic, by a “team of rivals” sinking their differences to work together in a larger cause. The phrase in quotes is borrowed from a book by an American historian, which deals with how Abraham Lincoln worked with his political adversaries in seeing the United States safely in and out of a bloody civil war. But it applies with equal force to the circumstances of newly independent India, when men and women of clashing temperaments and opposed ideologies likewise came together in the interests of their nation. Between 1947 and 1950, the task before India’s political leadership was to ensure the nation stayed together. Now, in 2010, we need not fear any more that the nation will break up into many parts. However, despite 60 years of electoral democracy, India remains a society riven by hierarchy and inequality. The life chances of a woman are worse than that of a man, of a villager worse than that of a city-dweller, of a Dalit worse than that of a Brahmin, of an adivasi worse than that of either a Dalit or a Brahmin. Some of these hierarchies have their basis in deep historical processes; others are of more recent origin. Gore Vidal once said of his adopted homeland, Italy, that it combined the worst features of capitalism and socialism. In some respects, contemporary India combines the worst features of capitalism, socialism and feudalism. Thus, the spurt in economic growth has widened the gulf between the wealthy and the poor, this compounding the gulf between official and citizen that was the legacy of state socialism, which itself compounded the gulf between mental and manual labour that was the legacy of the caste system. Personal behaviour reflects these broader trends in social inequality. The successful capitalist has contempt for those who do not earn as much as him; so too the powerful bureaucrat or politician for those who hold less power. On their part, the poor and the powerless tend to be deferential; taking these asymmetries of privilege to be divine or preordained, rather than particular creations of particular men behaving in, as it were, less-than-democratic fashion. Do we, in 2010, have leaders who can redeem the pledges of those who framed our Constitution in 1950? For a democracy to function at somewhere near optimum potential, three sectors have to simultaneously pull their weight. These are the state, the private sector and civil society. In 1947, when the nation was born, civil society was weak and the private sector risk-averse. The centre held, and a democratic constitution came into being, only because the energy and capability of the state compensated for the limitations of the other two sectors. Now, 60 years later, we have a dynamic private sector and an energetic civil society. It is the state that is wanting. In the 1990s, Narasimha Rao and Manmohan Singh initiated a series of economic reforms that unleashed a surge of creativity and productivity in the private sector. Those reforms were both necessary as well as overdue. However, they now need to be complemented by a second set of reforms, aimed this time at making the government more productive and efficient. For, the task of the private sector is merely to increase the size of the cake. To make economic growth more equitable and sustainable must largely be the responsibility of the state. The first institution in urgent need of renewal is the Indian political party. This must no longer be run as a family firm; rather, it should be open to individuals who can make their way up the party hierarchy on the basis of ability and ambition, rather than birth. The Congress became a national party because of the patient work done in nurturing state units by four generations of hard-working politicians. The first generation consisted of, among others, Bal Gangadhar Tilak, Gopal Krishna Gokhale, Lala Lajpat Rai and Bipin Chandra Pal; the second generation of M.K. Gandhi, C.R. Das, G.B. Pant, Maulana Azad, etc; the third generation of Subhas Bose, T. Prakasam, Jawaharlal Nehru and their colleagues; the fourth generation of K. Kamaraj, Y.B. Chavan, S. Nijalingappa, Sucheta Kripalani and others. Only one of the individuals named in the preceding paragraph was the child of a politician. Nor was this experience peculiar to the Congress. Those who built the dmk and the Akali Dal were likewise born into homes unmarked by wealth or privilege. It is this silent and often self-effacing work that forms the forgotten background to the rise of the Nehru-Gandhis, the Badals and the Karunanidhis, who, in a manner of speaking, have all thrown away the ladder that brought them to the top. Second, the civil services at both central and state levels need to be freed from arbitrary political interference. Postings and length of tenure must be decided on the basis of a person’s capability and performance rather than his caste affiliation or his proximity to an MLA, MP or minister. Third, this restoration of institutional autonomy must be extended to other state sectors such as education. Politicians should no longer decide who will head universities or research institutions; rather, the process must be in the hands of the academicians themselves. Fourth, there should be more lateral entry into government, particularly (but not exclusively) at the higher levels. Professionals from outside the state sector must be encouraged to join it. As things stand, generalist services such as the IAS are assigned jobs for which their background does not prepare them. Who is to say that an experienced doctor or hospital administrator would not make a better health secretary, or a senior lawyer a better law secretary, than those who currently occupy these posts? Fifth, our judicial process has to be made more transparent and efficient. There must be a greater willingness, among politicians and judges alike, to prosecute and send to jail those palpably guilty of corruption. This list of required reforms is indicative rather than comprehensive. But that the Indian state needs to be reformed and reinvented is manifestly clear. The question is: do we, in the year 2010, have the leaders who can finally redeem the pledges made by the framers of the Constitution in 1950—leaders who can make India, in Ambedkar’s terms, a proper social democracy rather than a mere political democracy? Some years ago, I wrote that while a democracy needs to be founded by visionaries, in mid-career it can be led by mediocrities. I now think that to have been a careless judgement. The times we live in, and the expectations engendered by them, call for leadership that is rather better than mediocre. The men and women who now rule India—whether from the centre or in the states—seem concerned, above all, with survival: the survival in his present post of an individual politican; the survival at the apex of the organisation of a particular family; the survival in government of a particular party. To plausibly and successfully redeem the ideals of the republic, however, this shall not be enough.